The English statesman Winston Churchill successfully led Britain through World War Two, a task he described as his 'walk with destiny' - a destiny for which he believed he had spent all his life in preparation. He was born son of a prominent Tory politician, Lord Randolph Churchill, at Blenheim Palace in Oxfordshire, and attended the Royal Military Academy Sandhurst before embarking on an army career. He became a politician in 1900 as Conservative MP for Oldham (a seat he had previously failed to win), but migrated to the Liberal party in 1906. His presence in the Houses of Parliament was notable, marked particularly by his rehearsed rhetorical method (meticulously prepared), despite a speech impediment that never left him. In 1917 he was appointed Lloyd George's minister of munitions and was involved in the mass production of tanks. This is now believed to have played a large part in Britain's success in World War One. From 1919 to 1921 he acted as secretary of state for war and air, and in 1924 he became Chancellor of the Exchequer. The next decade saw a decline in his status, during a period of political turmoil. But when war came, in May 1940, and Neville Chamberlain fell from power, Churchill came into his own and met his 'destiny'. His embodiment of the national spirit, and his unflinching determination in the face of Hitler's warmongering, won support across the country - even though he promised nothing more than 'blood, toil, tears and sweat'. Throughout the war he worked tirelessly, and built good relations with President Franklin D Roosevelt while maintaining an alliance with the Soviet Union. Churchill was regarded with suspicion by some British voters, because of what they saw as his ability to change parties at regular intervals. He was also unpopular with trade union members and the working class, as he was instrumental in helping to break the 1926 General Strike. Although he was seen as a great leader who didn't give an inch during war, he was not considered the man to establish a better Britain during peacetime, and he lost power in the 1945 election. He remained a vital leader of the opposition, however, voicing apprehensions about the Iron Curtain and encouraging European and Atlantic unity - this resulted in the formation of NATO. A final stint as Prime Minister came at the age of 77, and Churchill continued as a back-bencher into even older age. His contribution to the establishment of peace was rewarded with a string of decorations, including an honorary US citizenship, and accolades listing him among the greatest living Englishmen. Churchill first developed a taste for cigars on a trip to Cuba in 1895, where he went to observe the Spanish ruling forces put down a local uprising. Churchill narrowly avoided death in New York in 1931 when he was struck by a car travelling at about 30 mph. He had to spend eight days in hospital. He once said that the 'U-boat peril' was the only thing that ever really frightened him during World War Two. 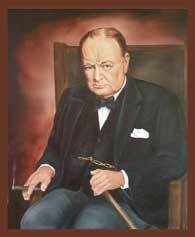 Churchill's great passion in life outside politics was painting. He produced over 500 works during his lifetime and was made an honorary academician by the Royal Academy.